A true legend, that is what you can call the Saint Bernard. Whenever there is a snow storm they go out and save the life of unfortunate walkers and tourists. His huge muscled body has a minimum height of 65 cm and he can weigh about 100 kilo. This makes him deterrent as a watchdog. 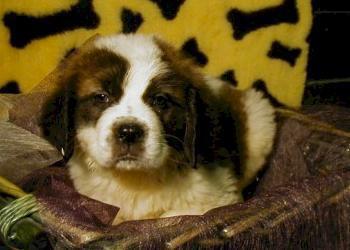 But the Saint Bernard is mostly known because of his soft character. He loves to be around his family. His fur doesn�t need a lot of treatment. The Saint Bernard has an excellent health.